This is a copy of an article I wrote last year. I thought it might look nice here. You may have been tossing the idea around, perhaps debating with yourself — you know, about Climbing Mt Washington in the Winter. Maybe you’ve been wondering if you have what it takes, physically and mentally. Perhaps you’ve had concerns about the mountain’s well-documented dangers (it is one of the deadliest mountains in the world, after-all). But here you are, maybe you’ve done it already: you’ve clicked the button and registered for your winter climb. Now what? What’s next? This guide is meant to help you answer those questions, and more. Hike mountains or hills if you have access, plus the right gear and knowledge, or try stair stepping machines in a gym setting, or simply take the stairs — a lot of stairs! Riding a bike and running may also help. Especially biking since some of the same muscles will get worked. Do it for hours if possible, but know that anything you do will help. Lose some weight. The heavier you are the more energy will be required of your legs to move you up the mountain and the more impact there will be on your joints coming down. Get flexible and tough. Practicing yoga or a martial art can really help. A great range of motion along with a balanced sure-footedness can aid both safe ascents and descents. Learn and use rest-stepping to conserve energy. Also monitor your breathing, sweating, hunger, and thirst. Being well will better your chances of success and lessen the demands. There’s not much more you can do to prepare yourself physically. Do try to train if you can, and also try to be in touch with yourself. Know your body and your body’s limits. The half way point in this climb is the summit nearly a mile in the sky and 4.2 miles away (or wherever we might turn around in bad weather), and you will want three-quarters of your energy available at that point. Aim high. Instead of focusing on that summit 4.2 miles away, include the return trip as well, 8.4 miles away. It will make that first 4.2 seem less daunting. Focus on putting one foot in front of the other. As nice as the views are, looking up and seeing less forward progress than you’d like can be tough. Don’t think so much. If you do think, think about anything but how hard it is or how much you’d like to throw in the towel and seek a warm shower. The rewards will come if you put in the effort. Speaking of rewards, when you do stop for rest breaks, try to enjoy the mountain. If there are nice views, relish them; if there is snotty weather, embrace it. Be positive. The mental game is a big one but the more your understand the phases, so to speak, the better you will be able to deal with them. This is true not only of mental challenges that come with the physical aspect of the climb, but even overcoming fears of the weather or “The Steeps,” as well. This article in Mike’s personal blog The Metamorphosis of a Hike, might help you understand. How to gear up for winter. Using crampons, how to step. The choreography of snow climbing. Managing yourself in steep terrain. 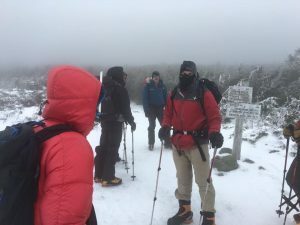 Ask a White Mountains hiker what the best training for the sometimes ridiculous Mt Washington weather is and they will invariably answer with nothing. There is no good answer. How does one train for hurricane force winds and sub-Arctic temperatures? 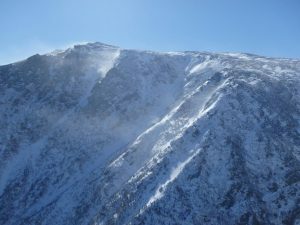 The climate above treeline on Mt Washington is said to compare to that of Labrador. That said, if you really want to experience that environment, you’d have to go to Labrador, on a cold day, during a terrible storm. Or climb Mt Washington with us and find out in person. The fun way. If you want more Mt Washington weather insight, there is no better source than the Mt Washington Observatory (MWOBS) located year ’round on the mountain’s summit. There you can get a short term forecast, access hourly conditions, recent recordings, and more. Our guides use this source as well as others. 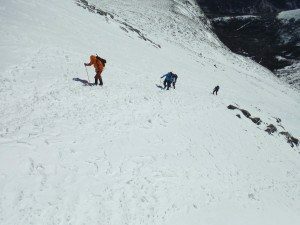 Another consideration, one closely related to weather, and certainly part of preparation, is understanding the danger of avalanches. Please bear in mind, the specific terrain we travel in, the default route as you will, is less prone to avalanches than other parts of the mountain such as the ravines, but where there is angled snow, possibilities exist. As we are concerning having a forecast, we are lucky to have avalanche insights via the Mt Washington Avalanche Center located on the mountain as well. Our avalanche-trained guides use this source in combination to their own insights. There are essentially two ways to prepare yourself with the right gear. Either consult your local outfitter and potentially spend hundreds if not thousands for the purchase of brand new mountaineering gear, or just rent it. Since we do offer rental gear, we can this make part of the experience simpler. Do, however, see the Mountaineering Gear List as many items needed you may already have thus saving you some money. Comment or contact us with your specific questions. We will try to advise you the best we know how. Not only do we know what gear will keep you alive and ready to climb another day, we also know what looks cool and can help you rock your Facebook Profile Pic.